Even though Jesse James wasn't sure that he could trust Bob Ford, the famous outlaw removed his gun—in Ford's presence—while in his home on the 3rd of April, 1882. Jesse was unaware of Ford's deal with the Governor of Missouri: If Ford would kill Jesse, the governor would give Ford a reward and pardon him for a prior murder. This image, by an unnamed artist, imagines the last seconds of Jesse's life. It is online via the State Historical Society of Missouri. After an attempted robbery in Northfield, Minnesota, in September of 1876, the James-Younger Gang disbanded. The robbery went awry and the Younger brothers were captured. Years later, two new gang members - Robert and Charlie Ford - joined forces with Frank and Jesse. Their last train robbery - on September 7, 1881 - was at Glendale, Missouri. Thereafter, using the alias of Tom Howard, Jesse moved his family to St. Joseph, Missouri where they rented their home. Zee wanted her husband to stop the robberies altogether. Jesse said he wanted to have enough money to buy a farm in Nebraska. He thought he’d plan, and carry out, one last escapade against a Platte County bank. Since even Frank was living elsewhere, the only two people left to help were Charlie Ford and his brother Bob. Neither had been with Jesse during his guerilla days. Neither were related to him. Jesse thought he could trust Charlie; apparently he was less sure about Bob. At the end of March, Jesse invited the Ford brothers to live in his home, to help him plan the bank robbery. He had no idea that Robert Ford had a deal-in-the-works with the governor of Missouri, Thomas Crittenden. Ford had allegedly killed a man and, in exchange for a pardon, worked a deal with the governor. If Bob Ford would kill Jesse James, the governor would pardon him for the prior murder. There was an added temptation: A $10,000 reward on Jesse’s life. It was hot the morning of April 3, 1882. After feeding his horses, Jesse took off his jacket and unbuttoned his vest. So no one would see his guns, if he needed to go outside again, Jesse did something he rarely did: He removed his gun belt. 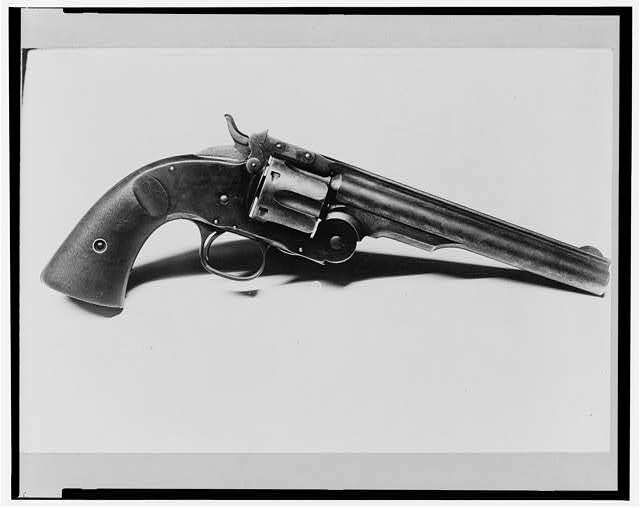 The last gun he used, according to the Library of Congress, was a .45 Schofield. In the house with the Ford brothers, Jesse decided to dust some pictures. Zee and both children were in the kitchen. With his back to his friends, Jesse heard a clicking sound. It was a sound he knew well - the sound of a cocking gun. Turning slightly, Jesse may never have seen who shot him. It was Robert Ford. A single bullet entered Jesse's head, disintegrating his brain. The ball was lodged at the junction of the suture which divides the occipital, parietal and temporal bones of the left side. In other words, the bullet did not leave his head. As the thirty-four-year-old outlaw dropped dead to the floor, his children ran into the room. Charlie Ford told Zee that a gun had gone off accidentally. His brother, the assassin, had already fled the house. whose name is not worthy to appear here. Although sympathy for Jesse’s exploits had weakened in the years before his death, many folks were still upset about his murder. Charlie, fearing for his life and constantly on the move, committed suicide within two years. Bob, who was proud of what he did, posed with his gun. For a time he appeared in Outlaws of Missouri, an act which let him tell his story again and again. Of course, he always failed to say he’d shot Jesse from behind. The town of Creede is nestled in a valley in Mineral County. Along with several tents, structures in the town include one and two-story wood-frame residences and commercial storefronts ...The cliffs of the rocky canyon that surrounds the town are immediately behind the buildings. Architectural elements of the one and two-story log, and wood-frame buildings include gables, false fronts, clapboard siding, cornices, and false fronts . . . Ore cars of the Denver & Rio Grande Railroad extend over the tracks in the town. . . Wood-frame residences and commercial storefronts parallel the tracks . . . Tents are scattered among the one and two-story wood-frame residences and structures. One of the tents in the town was a temporary saloon, owned by Robert Ford, “the coward” who assassinated Jesse James. Turning toward the voice was Robert Ford’s last act. Men carried guns, and shot them at will, during those decades of war and violence. Frank James decided to turn his gun in. He stood trial for his alleged crimes, was acquitted on all charges and lived to be seventy-two years old. Jesse, however, remains one of America’s most famous outlaws. But one thing about his story (and the way his life ended) is ironic. He (like most of his victims) died unarmed. Bos, Carole "ROBERT FORD ASSASSINATES JESSE JAMES" AwesomeStories.com. Oct 01, 2007. Apr 20, 2019.